Forum Index > Off-topic Talk > Grand Couse, is it period? Posted: Sat 24 Sep, 2011 12:33 pm Post subject: Grand Couse, is it period? I've suddenly developed quite an interest in the coutreau de breche or couse. Wasn't really aware of this until I saw one at the Castlerock Museum, and I find it a very interesting weapon. I'm having a lot of trouble finding more info on them though, as most google searches assume I'm misspelling "course", and coutreau de breche mostly turns up French sites which I can't read. I did find the picture attached, but since I can't find anything else on this I'm wondering if this was a modern imagining or if a "grand couse" did indeed see use. Any direction will be appreciated, thanks! 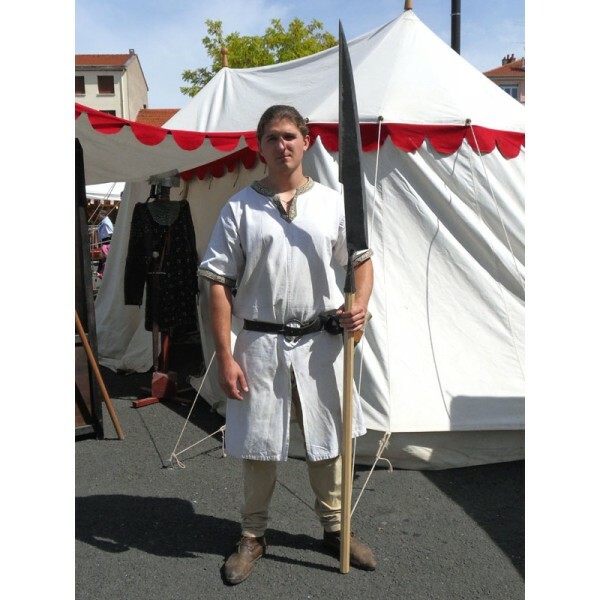 Impressive and " Couteau de brèche " translate literally as Breach Knife: I would guess a really big knife or polearm used to defend or attack in a siege a breach of the wall or maybe even create a breach or take advantage of one in an enemy formation ? Obviously this weapon would be used under different circumstances but seems by the name being a weapon to hold a narrow place by oneself or in small groups. First time I have seen one of these reproduced and at such a grand scale. As far as historical it does resemble weapons seen in period art. ( Not sure if there are any known surviving ones. It's a bit the same case with the so-called Medieval Choppers ). Looks to me like it's part of the glaive family. Still, I wouldn't want to be on the recieving end of it. I thought it was very impressive as well. I think part of what appeals to me is the simplicity. This isn't as fancy as many glaives I've seen; it's just meant to hurt things. Jean, do you happen to know the names of any of the period art pieces that depict weapons that look similar to this? In a battle scene of the Maciejowsky Bible. I'm sure a pic of it is on this site somewhere just search the Maciejowski Bible and or with Medieval chopper. Scale is something hard to be sure about as it may be just the way the artist decided to draw it and there could be some with longer hafts. I'm looking at it right now in my copy of " ARMS AND ARMOUR OF THE MEDIEVAL KNIGHT " page 61, man at arms/heavy infantry wearing a kettle hat and quilted armour on the left. Yes very similar but the one I found in the book seems to have a longer handle but shorter than in the pic you show of the recreated piece. Size and length is sort of speculation as they look like short 4' to 5' feet weapon with maybe 1/4 to 1/2 of the total length being the haft. Style wise both illustrations seem to be of the same weapon type. I sort of like the idea of a long polearm version but haven't seen any illustrations of a really long hafted one. Very interesting. That does indeed look almost identical, but with a bit of a shorter haft. I guess that's one more polearm to add to my list of things to buy! look up glaive or kuss or something in that family line. I seem to recall that the coutreau de breche is documented in Stone's Glossary. I'm on vacation in another state right now so I cannot verify that. I have a cut down volgue that looks quite similar. If anyone is interested I'll post a pic next week when I get home.